As some of you may know, I teach Knife Skills classes – the essential know-how for every cook in the kitchen. As part of my classes, I discuss knife safety and a variety of ways to keep the knifes safe. I’ve been dreaming of a magnetic knife strip for quite some time and am happy to report that the dream is now a reality. 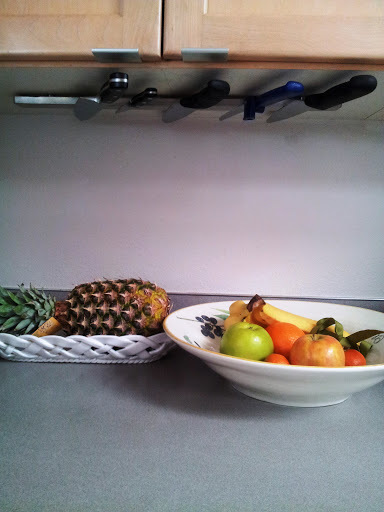 Usually, the magnetic strips are attached on the kitchen’s backsplash and the knives hang vertically. The Artist and I hung the strip on the bottom of the kitchen cabinet (ok, he hung it up and I just watched). The knives are attached to the strip horizontally, taking very little space. I love it! If you have kids or pets in your household, I would recommend a different system to store your knives, for safety reason. Interested in signing up for a Knife Skills class? Let me know – I teach both individual and group classes.